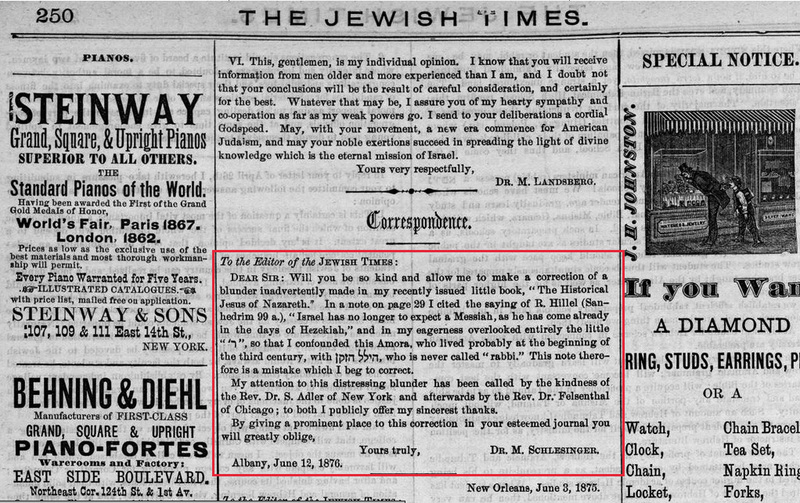 This appeared in the June 16, 1876 issue of The Jewish Times; the author of this book wished to call attention to an error - a"blunder" as he put it - in his book, concerning the identity of the Rabbi Hillel mentioned in the Talmud who taught that there would be no future Messiah, as he had already come in the days of King Hezekiah. The author writes that he omitted the title "Rabbi" and so presented this Talmud figure as if he were Hillel the Elder. Here's the footnote to which the author, Max Schlesinger, was referring. And I have to say - I am impressed that Schlesinger noted that he thought it was the 1st century Hillel, not the 3rd - he could have only said he omitted the honorific. Admitting this degree of error in so public a fashion is a breath of fresh air, fresh, 137-years old air. What page was this printed on in The Jewish Times? I'm wondering whether his correction was given "a prominent place". Good point and question. It was printed on the third page of that issue. Cover, inside page, and printed on the next page. The name "Dr. M. Landsberg" near the top of the page caught my eye. That would have been Max Landsberg, a product of the Breslau seminary, who in 1871 became rabbi of the Reform Temple B'rith Kodesh in Rochester and was there for more than 50 years. I've only recently heard of the existence of the word "Sanhedrim," and here I see it in actual usage for the first time.